The Prince of Wales has praised the Lake District after unveiling a plaque declaring the area a World Heritage Site. Describing the Lakes as "a particularly special part of the world", Charles said he is always struck by the resilience of communities in the area. "Over the last 17 years I have made regular visits here, beginning at a time of crisis during foot and mouth. 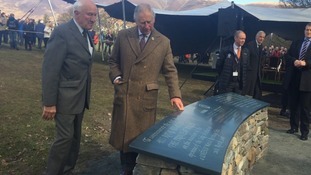 There were performances by schoolchildren and cast members from productions at the Theatre By The Lake before Charles unveiled the plaque, built on top of a dry stone wall.